The apparel company, Weatherproof, will become the official “temperature sponsor” of Giants Stadium; their logo and the temperature will appear prior to kickoff on the Jumbotron and public address at all home games. In addition, one lucky row of fans, picked randomly, will receive free Weatherproof jackets when the temperature dips below 32°. Unfortunately for fans, the average high temperature for New York is 65°F (Oct.), 54°F (Nov.) and 44°F (Dec.), so cross your fingers for more night games. Then again, given the Giants' track record with snow, that may not be such a bad thing. “Our new promotion at Giants Stadium is another great branding opportunity with local sports teams, that's as unique as our Yankee Stadium tarp sponsorship. Both branding promotions are part of our marketing strategies to reach our demographic in extraordinary ways,” says Eliot Peyser, CEO of Weatherproof. 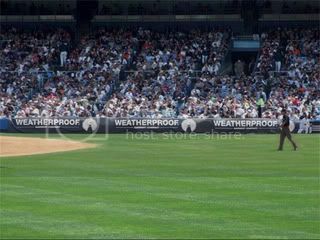 This past Spring, Weatherproof sponsored the Yankees' rain tarp. As for the Giants partnership, radio announcers will deliver a five second pre-game and five second in-game mention for 16 games featuring Weatherproof on Giants Radio Network and affiliates. Following in the Weather Channel model, also look for Weatherproof jackets for Giants' commentators. With the proliferation of environmentally-conscious sponsorships, it isn't that far of a stretch to see how "Official Temperature" could heat up across other properties.